Systematic Botany is the study of plant taxonomy. It’s basic biology – all species on this planet are classified using the hierarchical system Kingdom, Phylum, Class, Genus, Species. Alpha taxonomy, is more specifically the identification, description, and naming (i.e. nomenclature) of organisms,while “classification” is focused on placing organisms within hierarchical groups that show their relationships to other organisms. Understanding this technique for identifying and differentiating plants is the foundation behind the science of hybridization that allows growers to produce Marijuana that has specific desired effects for medicinal and recreational purposes. Cannabis sativa L. is the binomial name or the species name for the cannabis plant. It is from the family of plants known as Canabaceae, which includes other plants like Hops and Hackberries. There are variations to those sub species in the form of hybrid’s and one other subspecies, Ruderalis, which is less common. Easily Distinguished in the Grow Room. Sativas will always grow taller than their Indica sisters. Indoors I’ve seen sativas get as big as six feet while indicas tend to stay short – around three feet. Sativas can take a long time to finish, some extending to over 20 weeks. With sativas you could always change the 12/12 photo period to 11 on and 13 off to speed things up in the last few weeks. Indicas have a much shorter flowering time and can come in as early as 6 weeks., although most commonly averaging between eight and 10 weeks. With added CO2 they will usually finish a week earlier. With exception, the indicas tend to have a higher yield than sativa plants. There are two strains of the plant species Cannabis that have noticeably different effects on the user: Cannabis Indica and Cannabis Sativa. There is nothing like a sativa high which is coveted most by the recreational user, and it is the indicas that have the strongest analgesic effect when it comes to medical cannabis. It’s usually the sativas that have a higher amount of THC compared to CBDs. These two strains differ primarily in that Sativa acts the mind and Indica acts on the body. For depression, headaches/migraines, nausea reduction/increased appetite, C. Sativa is the strain to use. It also increases focus/creativity, energizes/stimulates and supports immune system. Alternately, C. Indica reduces pain, muscle spasms, inflammation and is an anti-convulsant. It also aids sleep, relieves headaches/migraines, stimulates appetite and reduces intraocular (eye) pressure. The two strains can and have been hybridized to enhance and combine certain effects, and the regulation of the industry provides opportunity to exact this science. Sativas have a wide range in flavors from flowery and fruity to extremely sour and heavy in ammonia scent. The indicas can also be quite fruity but their alternate range of the continuum is known by its distinct similarity to skunk aromas. Hi I’m Reggie I’m AAA indoor grower text me 802 729 2520 Reggie.. Informative article. 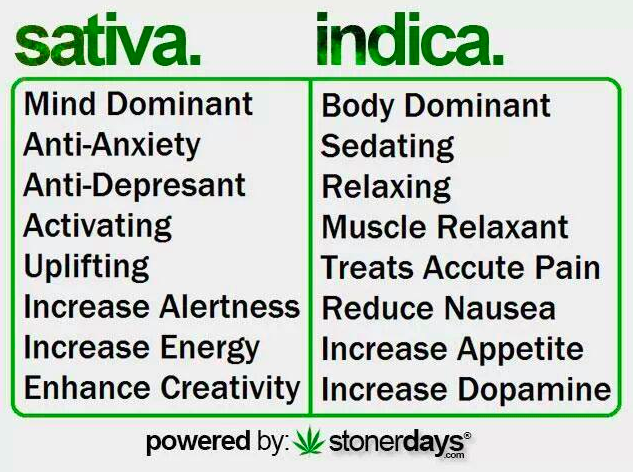 You describe well the difference between indica and sativa. Thanks for sharing this post.